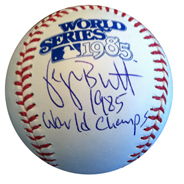 Powers Collectibles now has in stock George Brett signed 1985 World Series Memorabilia. 1985 was the last year the Kansas City Royals won the World Series. Feb. 27, 2012 - PRLog -- Kansas City, MO - Powers Collectibles has RARE George Brett signed 1985 World Series memorabilia in stock. Autographed jerseys, bats, and baseballs, all inscribed 1985 WORLD CHAMPS. The 1985 World Series was the last one the Kansas City Royals won. They defeated the St. Louis Cardinals 4 games to 3. On that team was the Royals best player of all time, George Brett. The 1999 Hall of Fame inductee helped the Royals win the World Series against their I-70 rivals. Recently, Brett completed a private autograph signing with Powers Collectibles. Each item is Major League Baseball authenticated. What the means is each item has a unique MLB hologram # verified on MLB's website. Each signature was witnessed by a MLB authenticator. Most sought after authenticity for MLB items. The baseballs are official 1985 World Series baseballs. RARE item to find, even unsigned. Brett signed and inscribed 1985 WORLD CHAMPS. Jerseys are official Majestic, with name and numbers sewn on. They also have the 1985 World Series patch. Size XL. Bats are official 34" blonde bats. All items are in stock and ready to ship! Mention this Press Release and get FREE SHIPPING.